Students at the University of Florida College of Journalism and Communications. Photo provided by University of Florida. Brooke Auxier considers herself among Capital News Service’s first social media strategists. She earned that unofficial title four years ago as a master’s student working at the student-powered news organization run by the University of Maryland’s Philip Merrill College of Journalism. “I looked around and asked, ‘Why aren’t we using our social media accounts consistently? Let me come up with something and we’ll make this happen,’” Auxier said. What happened to CNS’s social media presence in subsequent semesters largely depended on whether the new crop of students included any aspiring engagement editors who volunteered to guide the news organization’s social distribution strategy. This ad-hoc approach to audience engagement troubled Sean Mussenden, director of the CNS Digital Bureau. So in recent semesters, Mussenden assigned at least one student each day to be social engagement editor, tasked with selecting stories to promote on social media, crafting social-friendly headlines and tracking audience metrics on CNS platforms. Students indicating an interest in audience engagement as a possible post-graduation career path took the lion’s share of these shifts. This fall, Maryland is going one step further by creating what amounts to a fifth CNS bureau that focuses exclusively on social journalism and audience engagement (the working title). Four years after first wrangling the social media accounts, now with outside experience as a social media strategist, Auxier will finally get an official title at CNS: bureau chief. Maryland’s decision to make social journalism and audience engagement a well-defined part of the curriculum is a sign of growing recognition among journalism schools that demand is high for graduates with these skill sets. 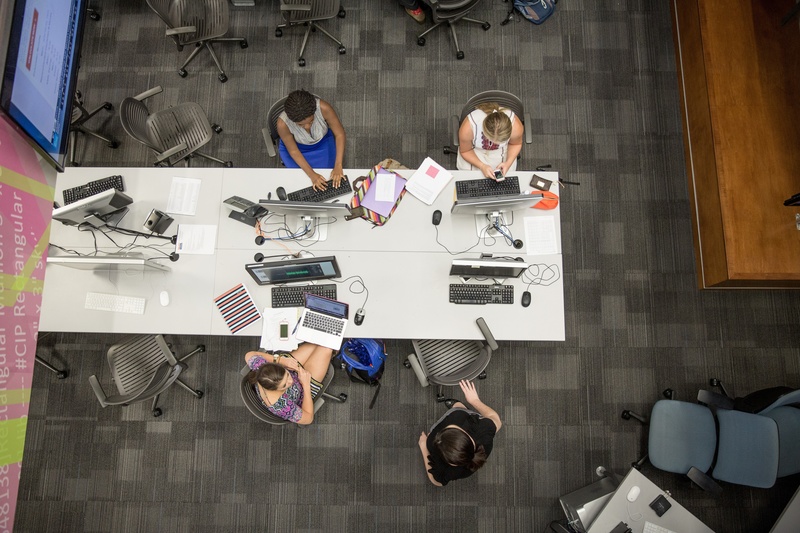 Training students for this emerging line of work, increasingly performed by full-time engagement editors, is a balancing act for schools that adopt the teaching hospital model where learning happens in the newsroom and classroom. Jessica Pucci, professor of practice at Arizona State University. Photo courtesy of the subject. The learn-by-doing approach means that students’ exposure to analytics dashboards and social media management tools often comes while they are working at university-operated news organizations. That’s the case at Arizona State University’s Walter Cronkite School of Journalism and Mass Communication, where students producing content for Cronkite News, the news division of Arizona PBS, can find real-time updates on story performance from a screen showing Chartbeat data in the newsroom. Jessica Pucci, a professor of practice at Arizona State who leads the school’s efforts to integrate data analytics and audience engagement into the curriculum, said her philosophy is to give students in the Cronkite News class who produce multiplatform content a realistic newsroom experience. That means using analytics to inform editorial decisions and assigning the digital production staff to run newsroom social media accounts. While Cronkite News students learn lessons about social media and analytics on the fly, students in Pucci’s digital analytics and the audience course do a deeper dive into audience data. University of Florida has a similar approach, with students in the news center practicum course who produce broadcast and digital content for the university’s media properties (including local NPR, PBS and ESPN affiliates) getting on-the-job training in analytics and engagement. One assignment asks students to track story performance using analytics software. Matt Sheehan, director of stories and emerging platforms and a lecturer at the University of Florida, said the professional news directors and college faculty who oversee student work use analytics reports as teaching tools to discuss audience engagement. Sheehan said it’s often a mindset shift for students to understand that they are doing work that resonates beyond the classroom. “It’s much easier for students to conceptualize that what they are doing can impact someone’s life by monitoring analytics and seeing how people are using and consuming their content,” Sheehan said. Students discuss these topics in greater depth in the social media analytics and strategy courses at Florida’s College of Journalism and Communications. The social media and news course, for instance, requires students to take shifts in the newsroom, known as the Innovation News Center, monitoring analytics for the university’s distribution channels and affiliated websites. As Deb Wenger wrote in MediaShift last year, Florida’s PR campaigns course worked with editors in the news center on using analytics to better understand its audience. At Northwestern University’s graduate student-powered news organization Medill Reports Chicago, part of the Medill News Service, students can volunteer but are not required to help with the social distribution strategy and monitor site analytics. Away from the newsroom, graduate students can take a mini-course on analytics, said Scott Anderson, assistant professor at the Medill School of Journalism and managing editor of Medill News Service and Medill Content Lab. Students who write for NYCity News Service, the distribution platform for student work at the City University of New York Graduate School of Journalism, track site analytics and use social media to promote longer projects, said Jere Hester, director of news products and projects and founding director of the news service. To create a more immersive experience, CUNY in 2015 launched a graduate-level social journalism program. Carrie Brown, the program’s director, teaches a community engagement course. CUNY students take a course called metrics and outcomes, taught last term by ProPublica community editor Terry Parris Jr., who gave students access to the nonprofit news outlet’s audience data. Finding data to analyze is often one of the greatest challenges in teaching students about analytics, Pucci said. Cronkite News audience data is a good start, but she said she also wants students to have experience analyzing metrics from newsrooms that are advertising-supported. Jordan Branch and Ryan Connors managing social accounts on primary election day at the Philip Merrill College of Journalism, University of Maryland. Photo via Facebook and used here with permission. Gathering audience data for students to analyze is one of the tasks facing Auxier, Maryland’s incoming social journalism and audience engagement bureau chief. The eight students expected to enter the bureau this fall will be in charge of social distribution and aggregation strategies, analyzing audience metrics, and other tasks. They will work closely with Mussenden’s data journalism and graphics team in the digital bureau, but they will be in a separate section. And there aren’t many settings other than journalism school teaching hospitals where there’s access to actual audience data and time to discuss engagement in a meaningful way. “Our job is to get students to think critically about what is the right thing to measure and what is the right way to measure,” Mussenden said. What audience metrics and other measures of impact should matter for news organizations that serve a variety of roles — training centers, news outlets of record and content distributors? Part two of this series takes on that question.